A De Tomaso Pantera to me is red, with a huge wing, stainless exhaust and a very loud and awesome V8. This one is the same age as me and it's great to think cars like this were being made when I was born. I remember seeing a few around when I was younger and I ended up meeting the guy who owned them. One was for the road and one for racing. Fantastic cars. 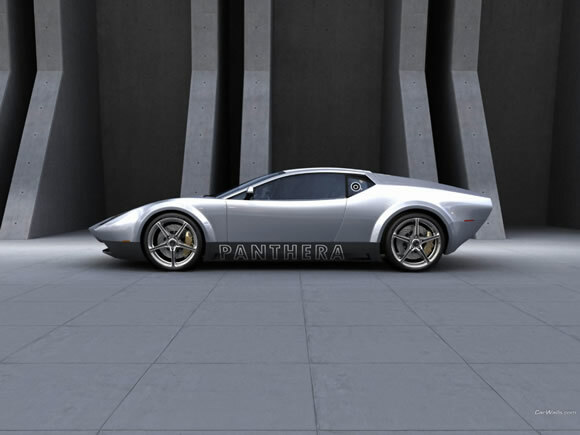 CAR137.com reader Brandon recently sent me an email about the De Tomaso with a link to an artists impression of what the Mark II de Tomaso might look like. View the pic here and view what the factory thinks here. I think they need to hire the artist. Update: I thought I would change the wheels on the concept car to the ones I liked. Let me know if you like this look better. The silver one with the red ones wheels would be awesome. Or it could be black. Then almost any wheels would look good.